Would this have been better? Cause she was the female choice. P.S. ~ I have that Nancy Drew book, along with about 50 others. She didn’t cross my mind. I got both the Columbo and Murder She Wrote references. I'm only 31 but people say I have an old soul. Btw I got my fourth Big Thunder ride this weekend! And it was at night too! Would have been five but the wife wasn't feeling good after the first go round so we decided to leave. We rode Splash just before that and saw fireworks going off just as we hit splash down. Being back there at night I can see why that is one of your favorite places to watch fireworks from. I was always more of a Trixie Belden fan. I agree that Angela Lansbury is a more appropriate @Tuvalu reference. I'm 37 but grew up watching those shows I lived with my Grandma and she loved them. I always preferred reruns of Kojak - I loved Telly Savalas Matlock was my least favorite. I have that Nancy Drew book, along with about 50 others. I have the whole set in boxes in my attic. When I was a kid I loved reading them. My great-aunt Sophie would buy them for me at flea markets. She had a list of all the books & would check them off as she got them. I loved those books!! For my sisters baby showers--when you bring a book for the baby--I would get them the starter set of the first 5 Nancy Drew books. I always hoped some of them would take an interest in reading them. I'm sure you figured out that so far none of them have since they are still in my attic. 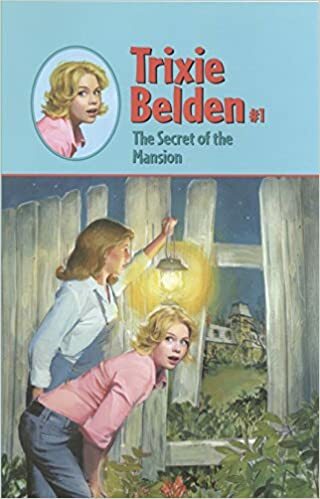 This is the first I've heard of Trixie Belden.....obviously a Nancy Drew WANNABE. Because I'm an OLD LADY?? Not to hijack the thread but bringing a book instead of a card is a great idea for a baby shower. It costs about the same and you write a note to the new baby and parents inside about why you bought the book. We did this for my son and we loved it. The guests loved it too. Now we are reading him the notes as we read the books again and he knows who the people are. I loved Nancy Drew! I still have some of the books too. I will never forget, when I was at the grade level in elementary school when I could finally check out all the Nancy Drews I had longingly looked at for so long. I admit I was a bit worried that the Emporium wouldn’t have the exact Minnie band that needed to be replaced. I really liked that white band! Could it be possible that the battery was dead? But I’d only purchased the band in April! Why had it suddenly stopped working? Was it just a lemon? So many thoughts running through my mind. It took a few moments for us to find the MagicBand display. Woody couldn’t believe the transaction was as simple as handing the CM my voucher. Since we were leaving the park, I decided keep the band in its original packaging and link it myself once we got home. And now, for @MinnieM123 and any other sleuths out there, the REST OF THE STORY. I threw away my “broken” band when I unpacked. A few days later I opened my new band and logged into my MDE account....where I discovered that every MagicBand from 2017 and 2018 was missing from my account. (Bands from 2013-2016 were still there, listed as Inactive since I had previously deactivated them.) A few of the “missing” bands were decorated with stickers that I planned to wear again. I decided to stay calm and fetched my decorative bands from the drawer. I’ll just re-link them to my account, I thought smugly. First I linked my new Minnie band....no problem! Then I linked my Christmas-stickered band....success! But when I attempted to link the others I kept getting an error message. Rather than become exasperated, I decided to “let it go” and simply order new stickers for future bands. Until I went in to renew my AP. In the past when I have renewed my AP, the new AP immediately appeared in my MDE account alongside the other ticket media (current AP, MVMCP ticket, Em’s AP). The renewal was automatically linked and I only had to stop by Guest Relations to pick up the yellow discount card. However, this time I got a message saying I needed to go to Guest Relations in order to activate my AP. Em’s AP is on the same renewal schedule as mine. When she renewed her AP, the new pass appeared in MDE linked and ready to go. No message to stop at Guest Relations to activate it. I had a BIG problem. Without an “active” AP, I would not be able to make 60 Day fastpasses. And my 60 days was less than a week away. So I picked up the phone and dialed Disney. My estimated wait time was 20 minutes. Thirty minutes later my call was answered. I explained that I had renewed my AP but it wasn’t listed. My call was transferred....and the connection was lost. Tuvalu broke My Disney Experience. Again!! Over the course of the next two hours (most of it “on hold”) the CM and someone in IT worked on my account without success. The CM said my problem was now “escalated” and it could take as long as 72 hours before someone would get back to me. In the meantime the clock was ticking down to FP day. Ugh! I can't "like" that post!!!! What a nightmare. Call me a dinosaur, but I seriously wish they'd do away with all these "enhancements" and just let people buy park tickets, and give them keys or cards to access their hotel rooms. Sorry you had to deal with this mess--NOT a fun way to spend a vacation!! Oh nooo the suspense is killing me!!! !